Sometimes I feel like I’m revisiting my favourite recipes over and over. 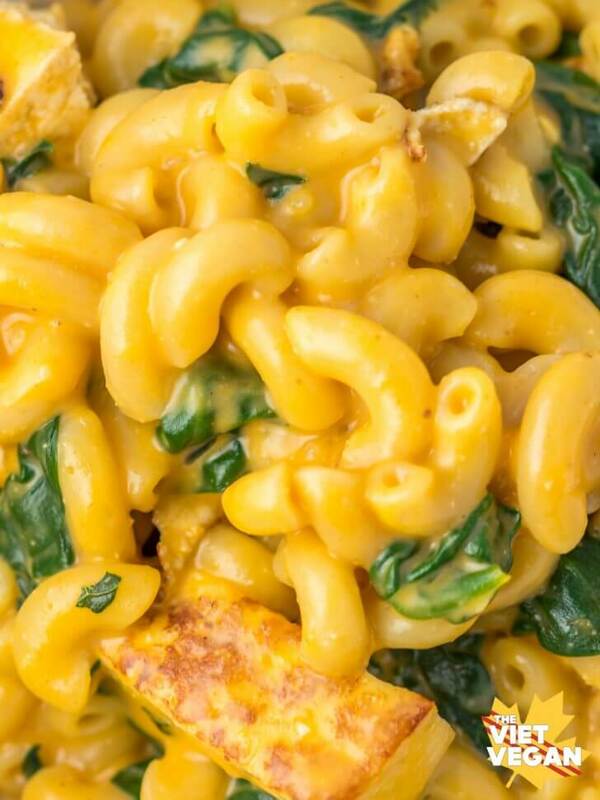 Mac and cheese done this way and that way. I was afraid you folks wold be sick of it, but I’m not sick of it—I adore mac and cheese. Creamy, silky, tender, chewy. 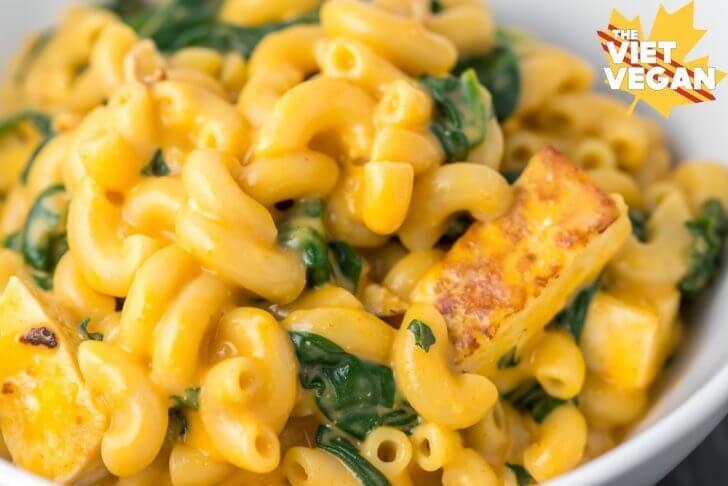 With buttery spinach, tofu bursting with flavour, and velveteen cheese sauce with a kick of heat marrying everything together. I never really enjoyed mac and cheese growing up—it wasn’t until I was 14 that I had my first taste of Kraft Dinner. But maybe at that odd age, the age I moved to a new city and made the effort to be a part of the popular group. Confused, exhausted and alone, I turned to the comfort of mac and cheese and my online friends to make me feel like I belonged somewhere. That kind of makes me sound like the ultimate loser, doesn’t it? When I first moved to the new city, I had this notion of becoming popular and how that would make me happy. I became a part of the cool kids group. I went to parties, I knew who liked who, I giggled with the popular girls—until I realized that parties bored me, I didn’t really care who didn’t like who back, and the jokes some of the popular kids told were honestly not even that funny. It’s exhausting, being around people you don’t really feel safe around. Trying to put on a cool facade, where you’re funny, wearing what everyone else is wearing even though it’s uncomfortable and doesn’t make you feel good in your own skin. After maybe about 2 months I gave up and found the nerds who were much more interesting to me. I didn’t have to try to be a coordinated athlete, I was much happier watching Lord of the Rings on the couch instead of Candyman while other kids were drinking. I learned my lesson when I was 14, so you’d think that I’d know better by now, wouldn’t you? It seems like that desire to find your spot in the group doesn’t ever really leave you. From YouTube circles, to blogger groups, to even my friends or new people that I meet. Much like my 14-year-old self, I’ve decided that it’s not worth the effort of being wittier than I am or more colourful than I care to be. My friends have spread out and I felt a little lost and without my tribe. I’ll be who I am and I’ll find my people again. It worked once, and it’ll work again. Preheat a pan over medium heat. In a bowl, mix oil, black salt, garlic powder, and soy sauce until combined. Toss cut tofu in the sauce until coated. Add to heated pan and cook until browned and extra moisture is cooked off. Set aside. Bring a large pot to a boil and cook 2 cups of macaroni until tender. Meanwhile, heat a small pot over medium heat. In a small bowl, make a slurry with 2 tbsp of non-dairy milk and 2 tsp cornstarch (whisk until cornstarch is dissolved and no lumps remain). Mix in red curry paste until incorporated into the slurry. 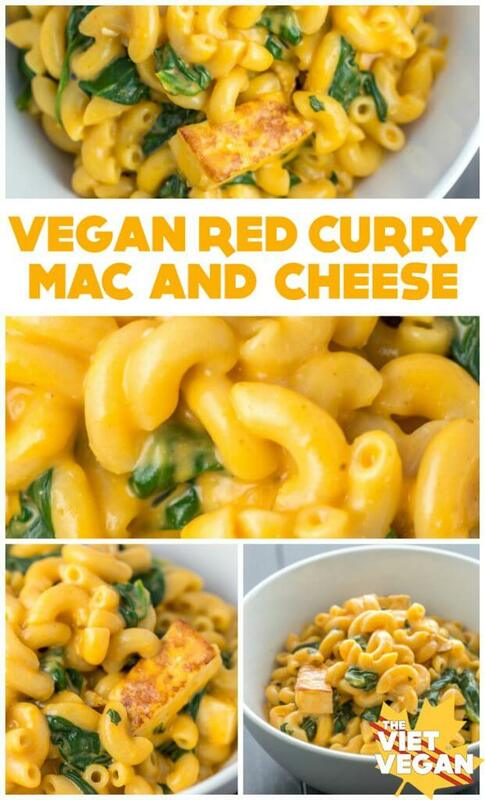 Add remainder of non-dairy milk to pot, then pour in red curry slurry, garlic powder, and vegan cheese. Stir until cheese is melted and you get a thick but smooth cheese sauce. 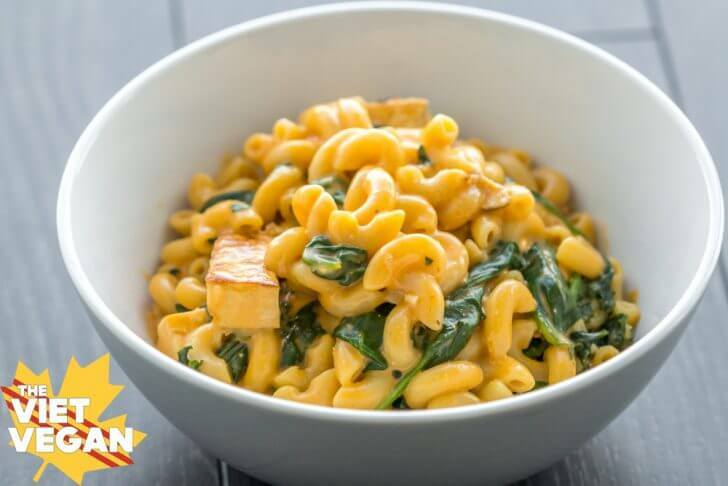 Before macaroni is completely cooked, add kale and spinach to the pot and cook until wilted. Drain macaroni and greens, then transfer back into the pot. Stir in cooked tofu and cheese sauce and mix until well combined. Add salt to taste, and serve! Oh for sure, I still have my core friends I can call anytime I really need to talk, but I miss having those friends that just can pop by on a weeknight to hang or something, y'know? Hi Lisa, I really enjoy and appreciate your blog and video's! I hope that I'm not being too forward, but you mentioned in one of your video's that you have eczema. I used to have eczema, my hands would be so sore and painful. I found that taking grapefruit seed extract helped.. I'm not a doctor, but there can be a connection between what is called leaky gut syndrome and eczema, ( Google it). Sometimes with leaky gut syndrome there can be an imbalance in the gut microflora which can lead to a systemic yeast over growth, which can sometimes cause painful swelling and cracking of the skin on the hands, (which is what happened to me). I used an antifungul cream on my hands and it helped. I also found that taking probiotics helped. I hope this information will bring you some relief from your eczema. Good luck and thanks again for the entertaining and informative video's and blogs and for being Vegan! Thanks for this! I've talked to my gastroenterologist about leaky gut earlier this year and how I felt like I had a lot of the symptoms of leaky gut, but all my doctor said was to cut out gluten =/ I went on a kombucha craze and probiotic/fermented food spree last year and I think it was just a little too acidic for my body and I started to break out, so I cut it out for a while because I was a little afraid. I'll have to look into it again for a second opinion. Hello! Not sure what curry paste folks are using, but as someone who has a deadly shellfish allergy, just wanted to remind that a lot of store bought red curry pastes are not vegan/contain shellfish. Something to lookout for. Cheers and thanks for the recipe! Looks good! How many calories? Not sure! I don't calculate calories. Girl, this mac n cheese fucked up my day. Congratulations on somehow making a dish that was somehow both bland and repulsive. This is so bad that I felt compelled to leave a scathing review after ONE BITE. Jesus christ, lady. Find a new passion because you're recipes are the detritus of the culinary arts. I just served this -- the family loved it! It was nice and easy. I used a mild red curry paste, as I can't eat spicy food. The result was delicious, a subtle yet pleasant and creamy mac 'n cheese. I made a bit more than the recipe said, and the three of us piggies all had seconds! I'll definitely be trying your other recipes, Lisa!